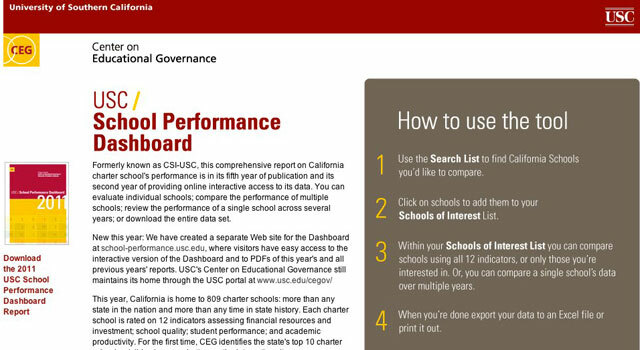 The School Performance Dashboard web project was developed for USC’s Center on Educational Governance provides an easy way for educators and others to explore a range of performance metrics for charter schools in California. Each charter school is rated on 12 indicators assessing financial resources and investment; school quality; student performance; and academic productivity. 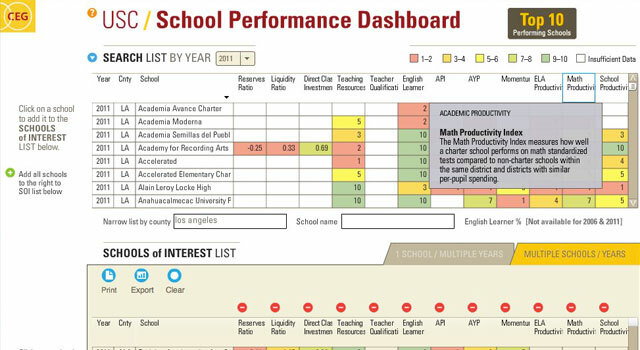 Users can evaluate individual schools; compare the performance of multiple schools; review the performance of a single school across several years; or download the entire data set. The challenge with this project was to make access to thousands of database entries easy to use for school administrators, researchers, parents, and the press. By creating a clean and clear visual and interactive system, users can explore the data in a very direct and productive way. Working with Liz Burrill and Jamie Cavanaugh, I developed the interaction design and functional capabilities, and then built out the database and software. The system allows users to do incremental searches based on county and/or school name, showing immediate results as the user types. 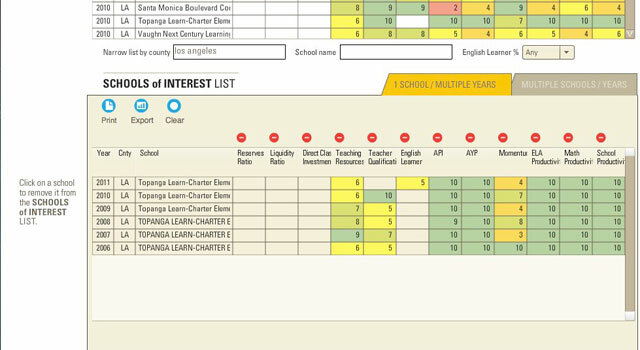 When a school is selected, it animates into the Schools of Interest List, building the user’s personal list of schools to analyze. The list can then be customized by narrowing the set of indicators to focus on, and then printed or downloaded as an Excel file. Alternatively, the user can select any single school, and analyze it over several years to see how performance has changed.